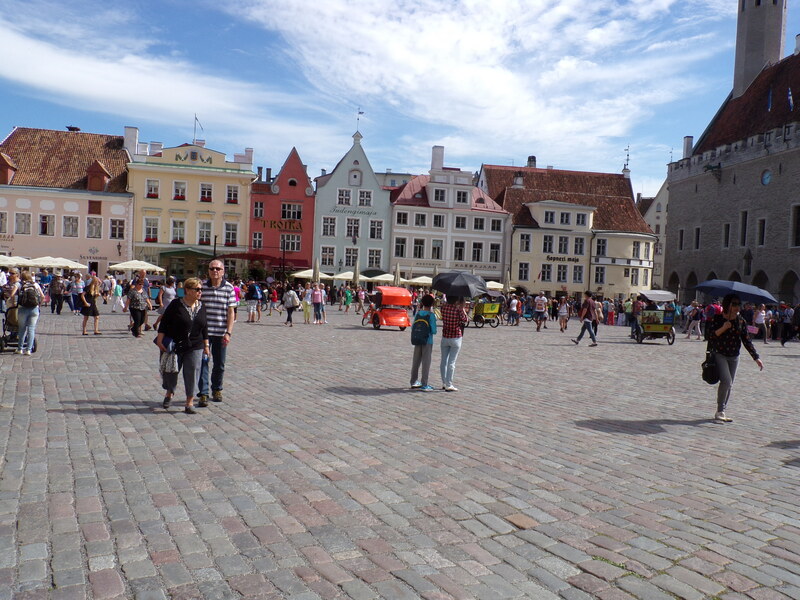 When the bus dropped us off in Old Town Tallinn, the first thing I noticed were the hordes of people everywhere! 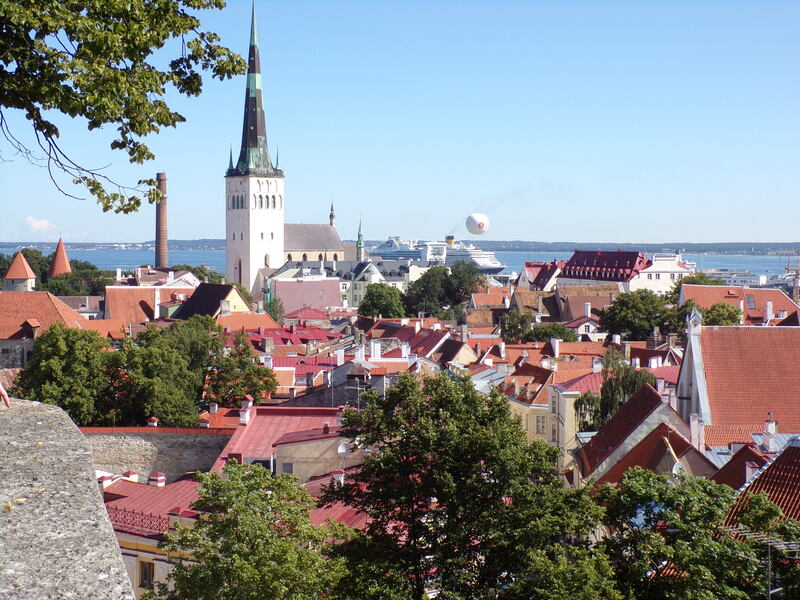 Since there were six cruise ships in port, each containing an average of say, 2,000 passengers – plus Tallinn has become a popular destination in Europe – Old Town was swarming with tourists. (Never mind the people that actually LIVE there who were navigating those same spaces!) 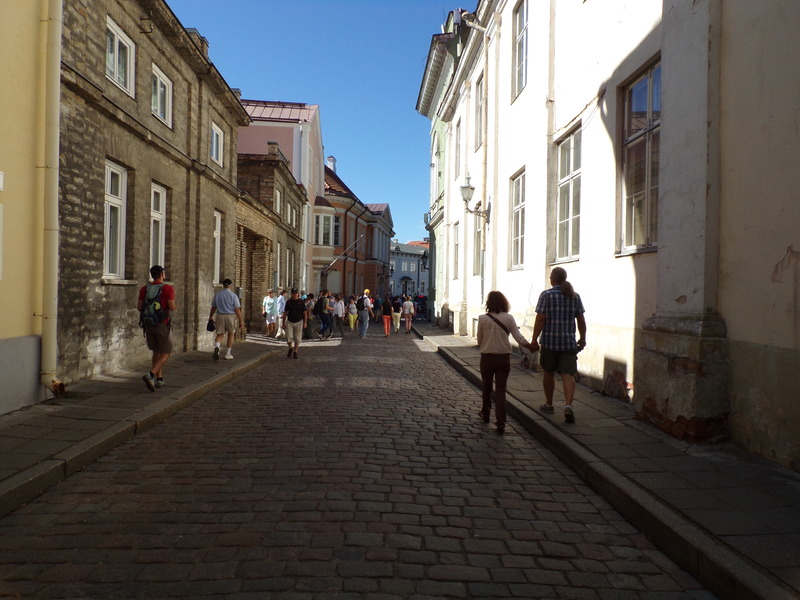 The sidewalks were narrow and so many people passing that you were often forced to walk on the uneven cobblestone streets. This also meant that groups led by guides, who held up signs with their tour’s number, often stretched along considerable distance and it was hard to keep up, especially if, like me, you often wanted to stop to take a picture. Which I did, often. 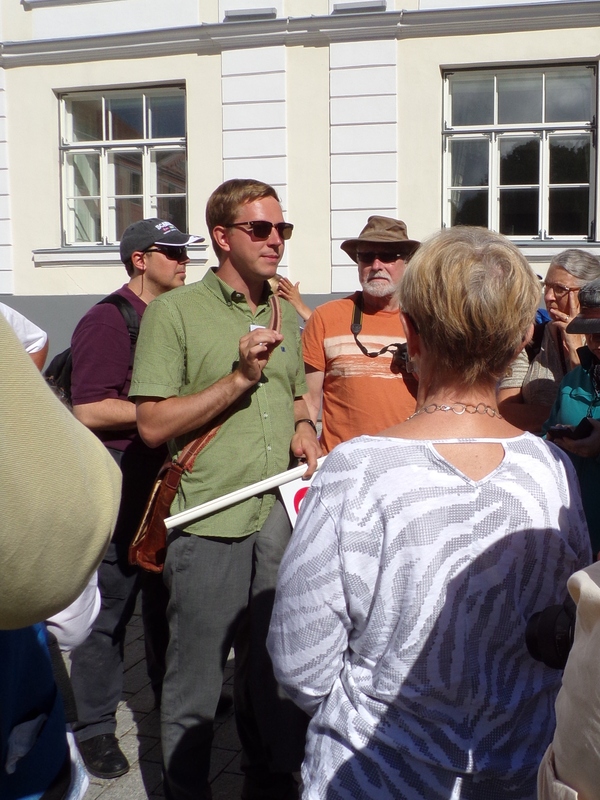 Our Matthew-Crawley- look-alike guide, Uve, gathers us around to give us a little history of what we were seeing. Uve told us we could have some free time to explore shops and go to the bathroom. 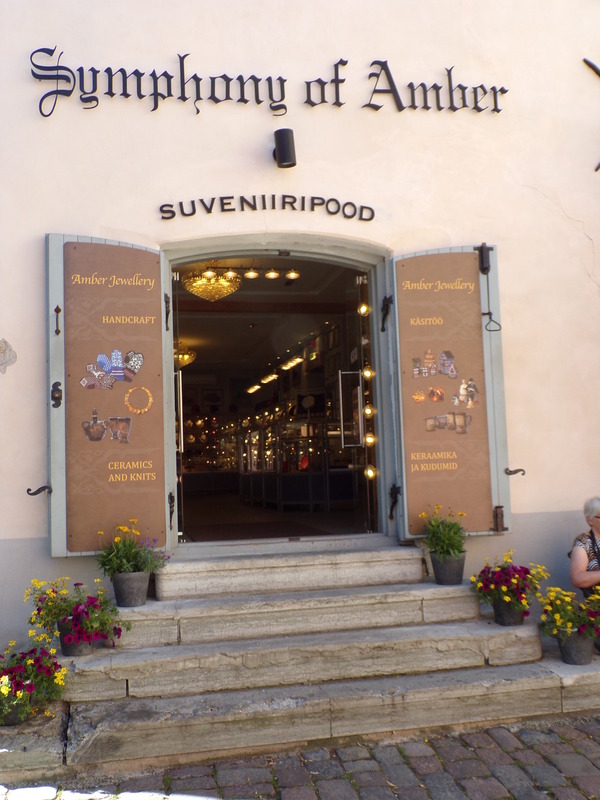 There were several amber shops with beautifully decorated doorways. Amber is a major product of the Baltic Sea. 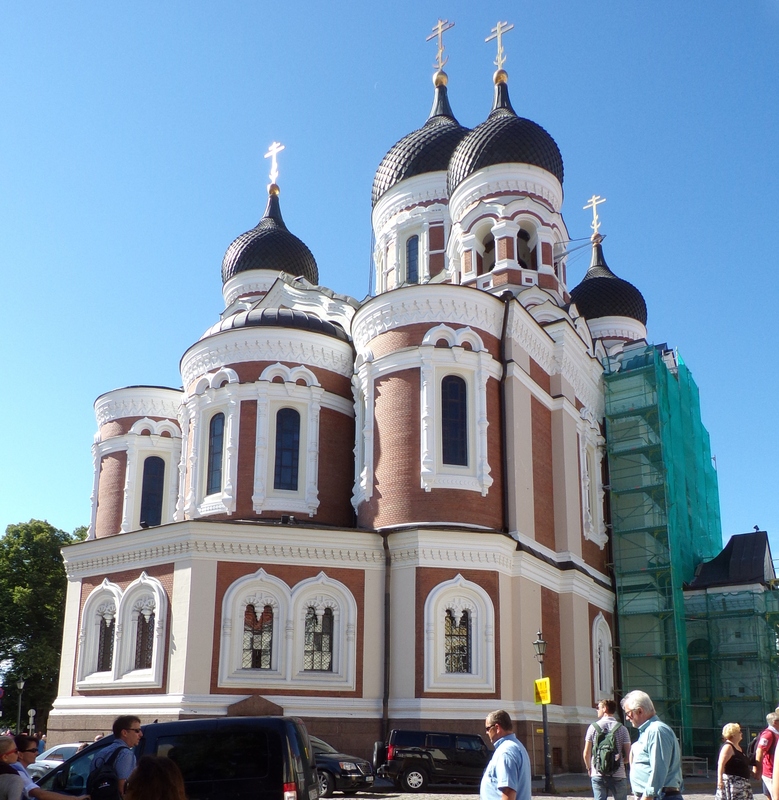 didn’t go in because of the crowds and Uve said we’d see Orthodox churches in St. Petersburg. 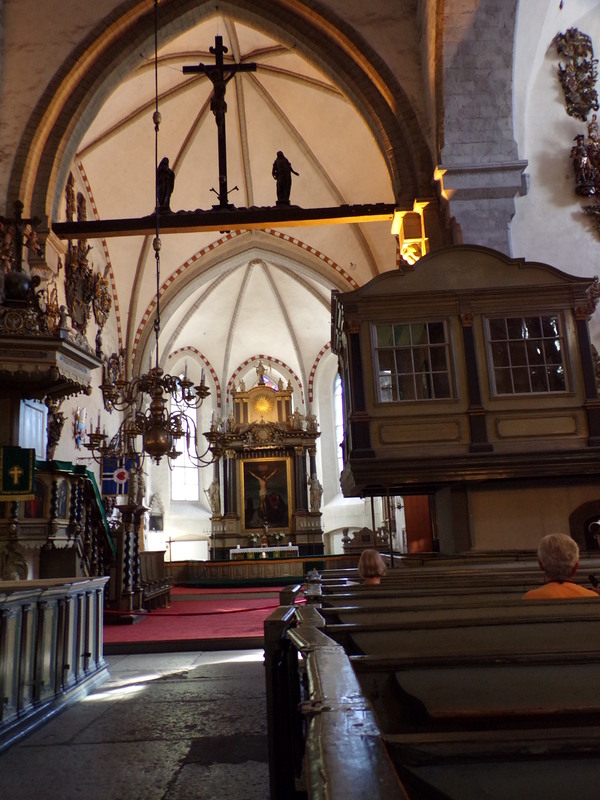 We did, however, enter St. Mary’s Church, built in 1240 and now a Lutheran church. 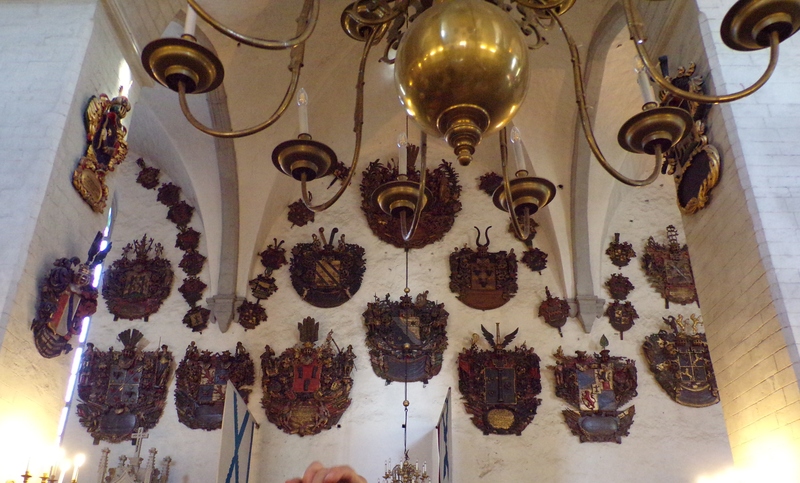 Family crests covered the walls, some quite large due to one-upmanship. Uve told us this was a common and prestigious thing to do. Families also had their own pews, each sectioned off by a small door with the family’s name on it. Looking toward the main altar. 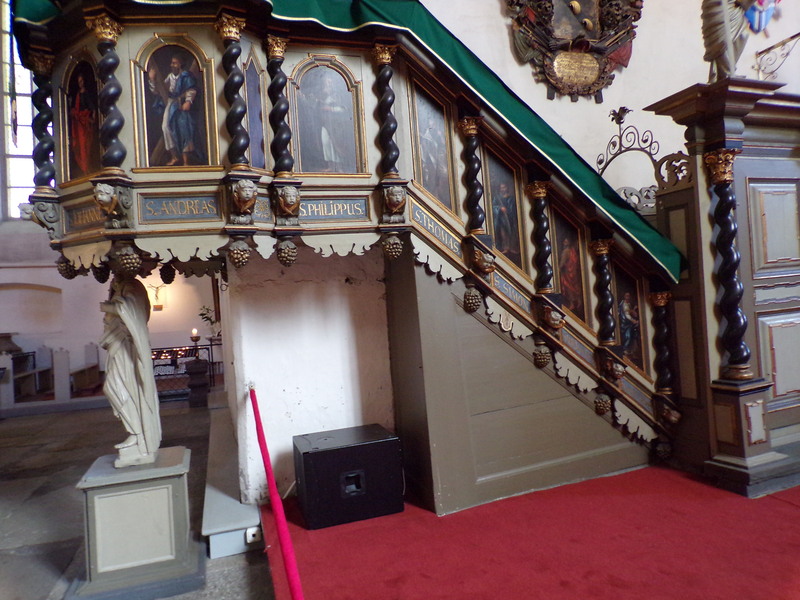 Note entrances to pews have little doors – families had their own section. 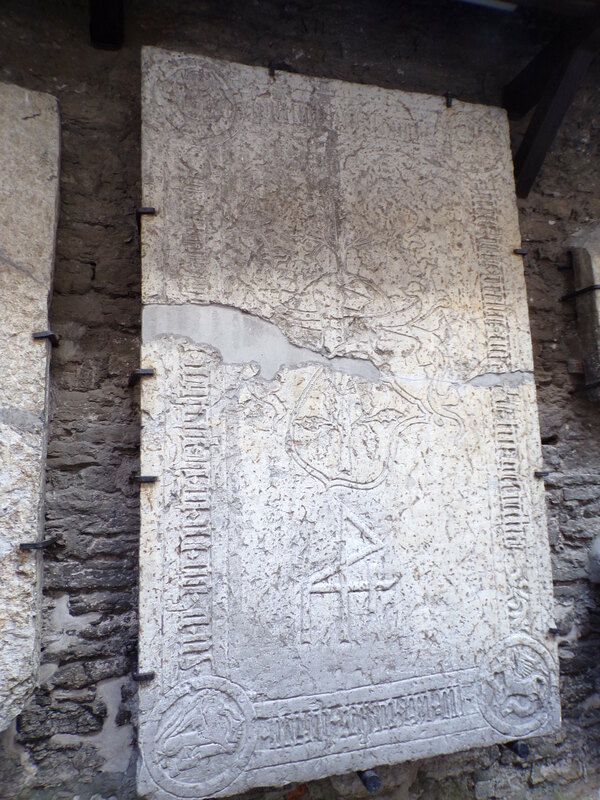 Having your family crest on the wall of the church gave you status. It established your family’s importance in the community. 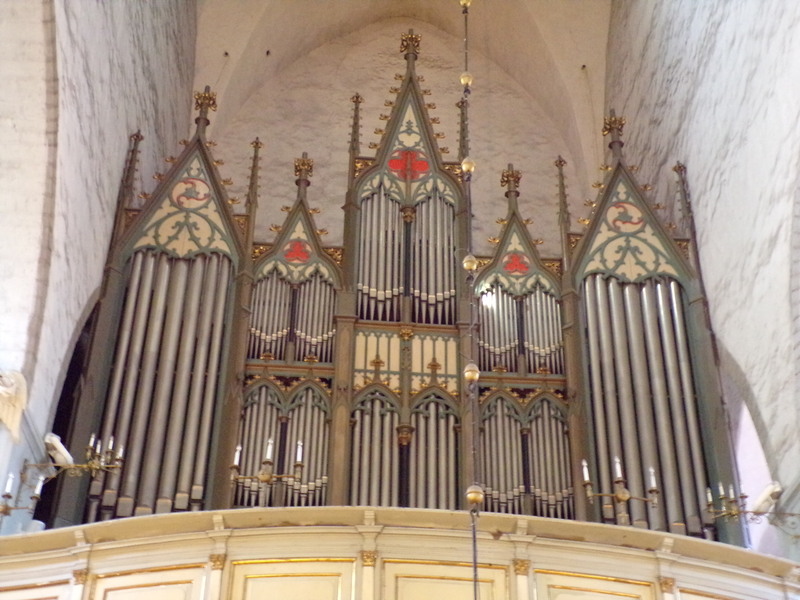 The organ was the most impressive thing in St. Mary’s Church. 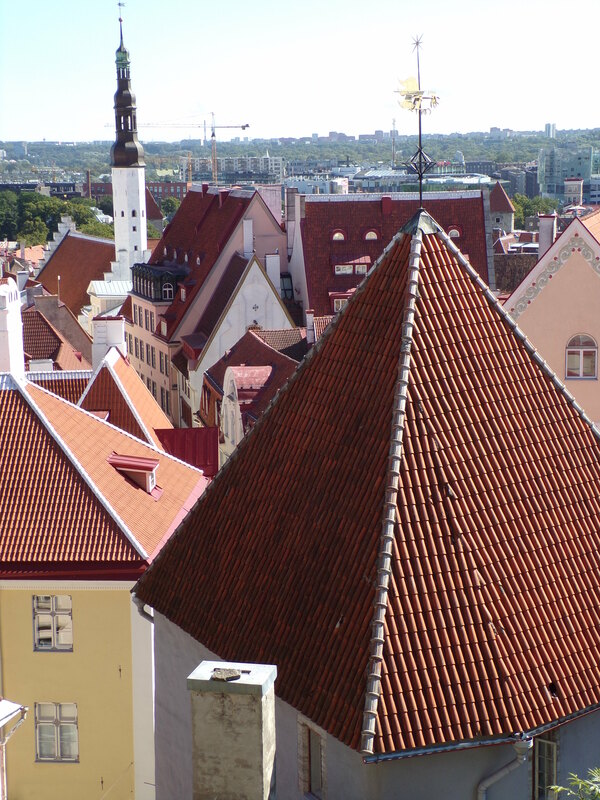 It is the largest in Estonia and has over 5,000 pipes. 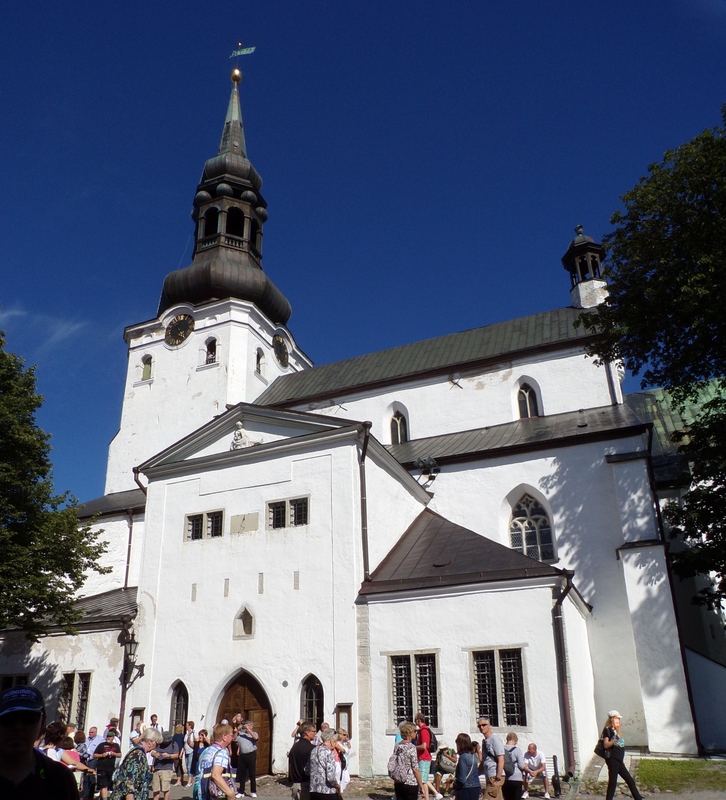 Both St. Mary’s church and Alexander Nevsky cathedral are in the area of Old Town called Toompea. 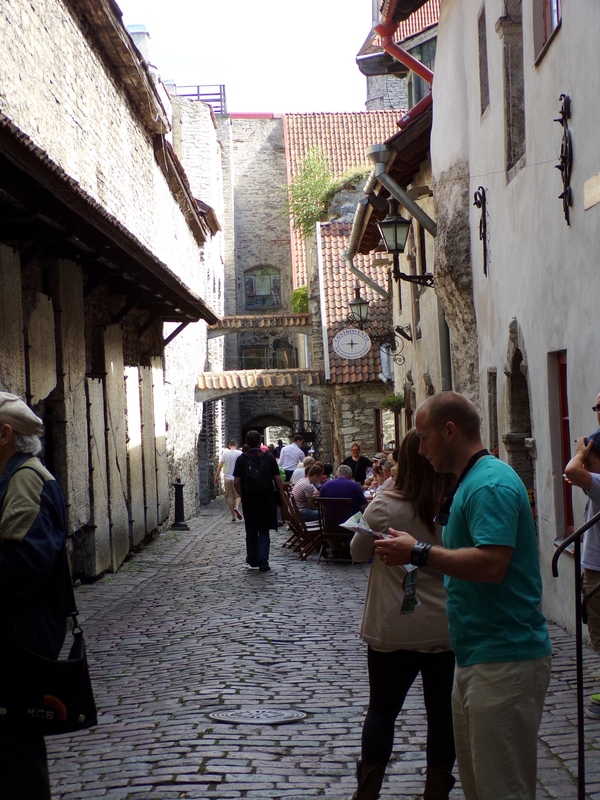 Our group headed to a lookout platform, where we could see Old Town Tallinn below and take photos. To get to this advantageous spot, however, you first had to patiently wait for someone to move and then worm your way through the crowd that was clicking away. 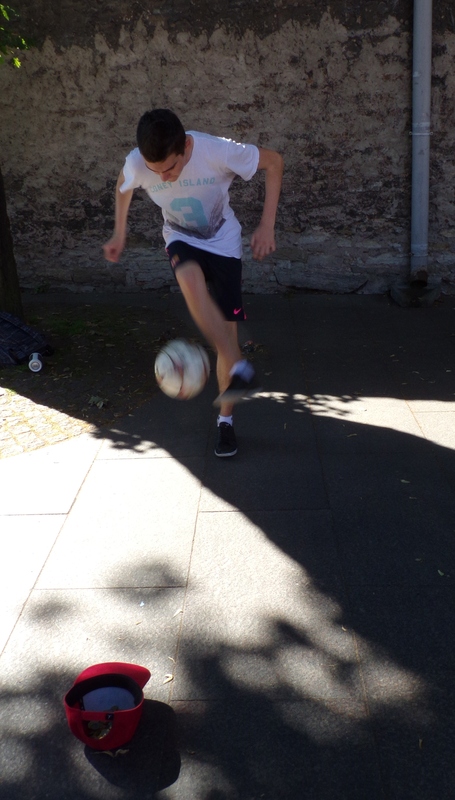 Meanwhile, there was a teenager there who was doing fancy soccer moves for the public, a red cap on the ground in front of him for tips. 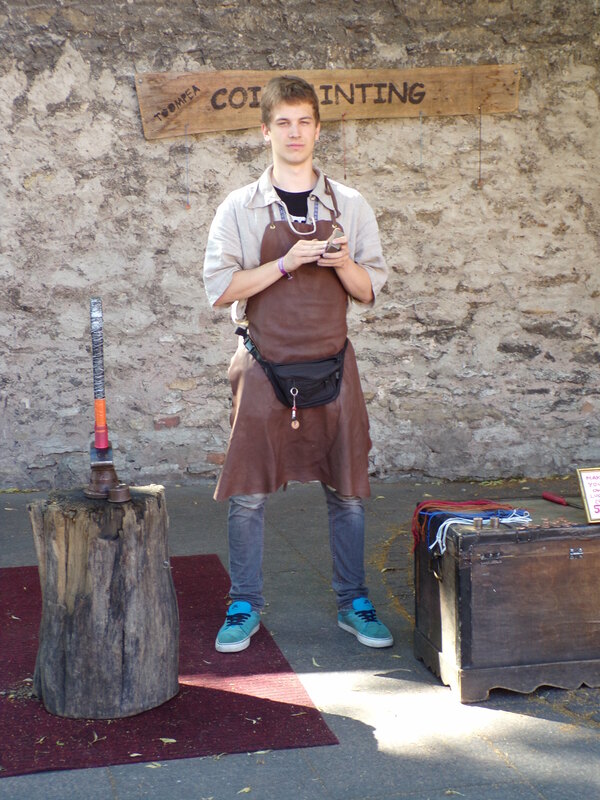 Another young man was standing in front of a sign that said “Toompea Coin Minting”. After creating the coin, he would sell it to you on a lanyard. When I finally reached the vantage point to take photos of the town below, I could see why it was such a popular place for tourists. Below us lay Old Town Tallinn and beyond, as far as the dock where our ship was anchored, the Tallinn Balloon floating overhead. 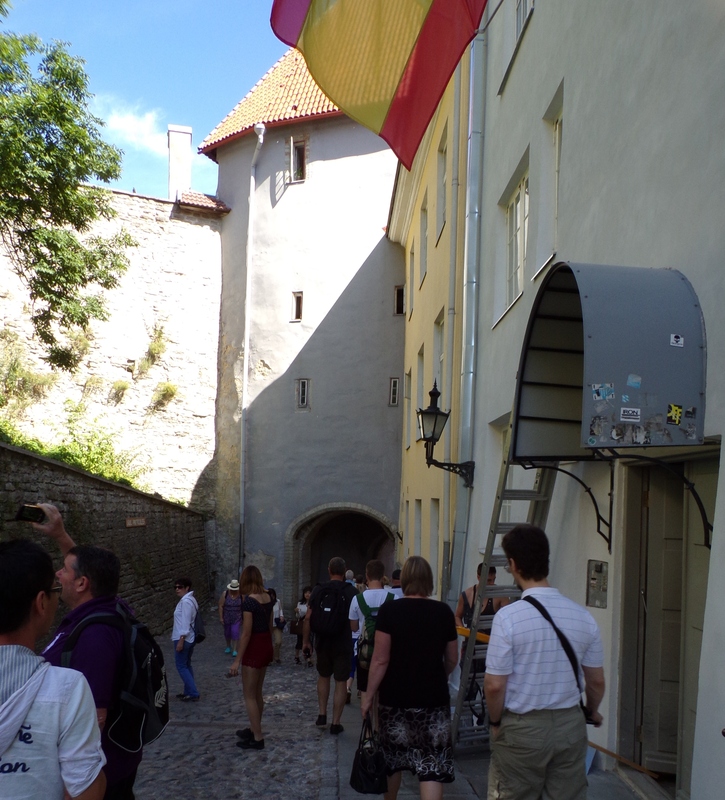 Back on the walk, I got behind again – it was near a turn into another narrow street – and lost sight of my group and Uve with the sign. They’d obviously turned a corner, but which one? A crowd of people were ascending a narrow alleyway, so I went with the flow, figuring I’d catch up with the group at the top. Just then a man was coming the other way wheeling his daughter in a stroller and I had to move aside to let him pass. Meanwhile, a stream of people squeezed their way around me on my right. When I reached the top, I looked left and right – by that time, there no sign of them. So I guessed: I went right. 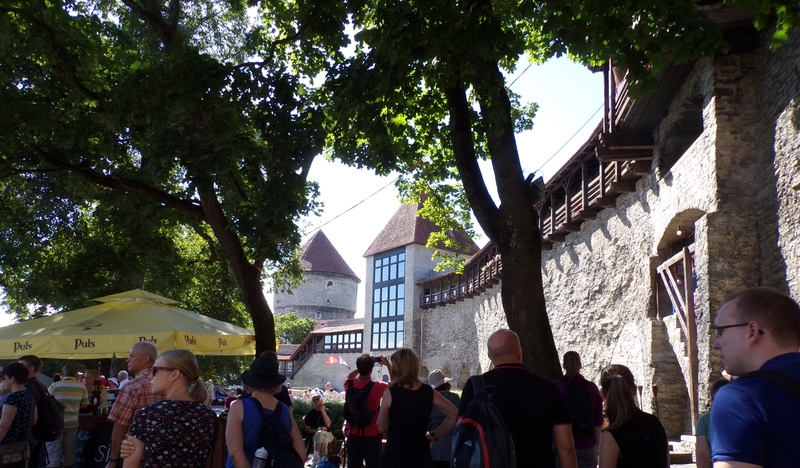 I came to another lookout point in a small square where outdoor restaurants were full of chatting customers, and on the right was part of the old wall that once surrounded the town, and a tower which may have been part of a gate at one time. There were steps going up the side of the wall to a restaurant located in the tower, and I saw people climbing the stairs. Not many though and I was sure it wasn’t my group. 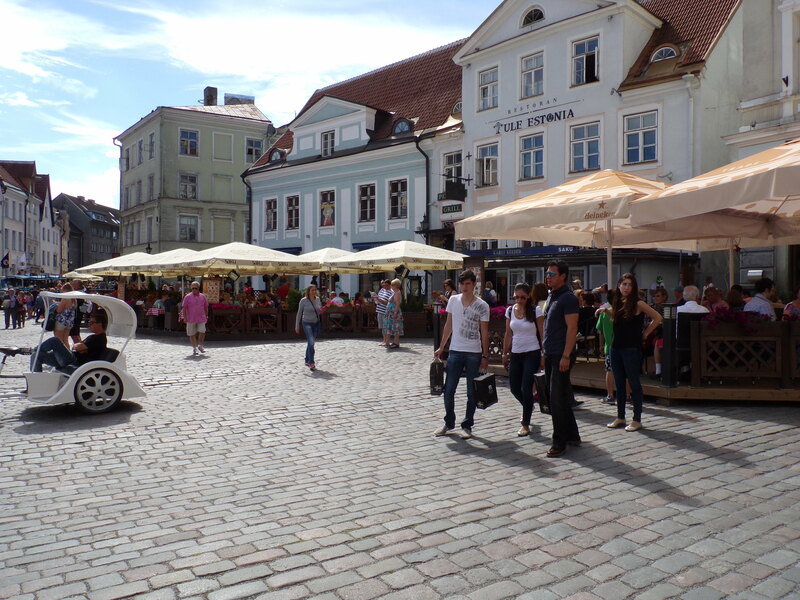 At this point, I was lost and came into this square with a section of the old wall and restaurants. I asked myself if there were any hints about where they might be. I had heard Uve mention something about checking with the café to see if our lunch was ready. Did he really say that? If so, they could be on their way to lunch. Did anyone know I was missing? Uve always counted – surely he’d know. But how would he find me? 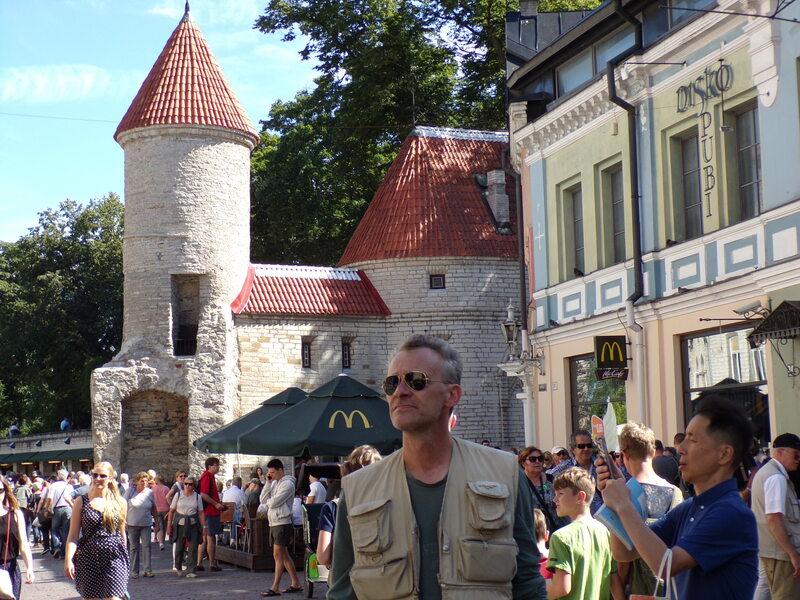 I left the square with the old wall and busy restaurants and tried to retrace my steps. I got back to the street that I’d been on before turning into the alley, and peered down other streets leading off it. No sign of them. I began wandering aimlessly, trying to think and not panic. I came up with nothing – no plan of action and feeling sorry for myself that I’d miss lunch! 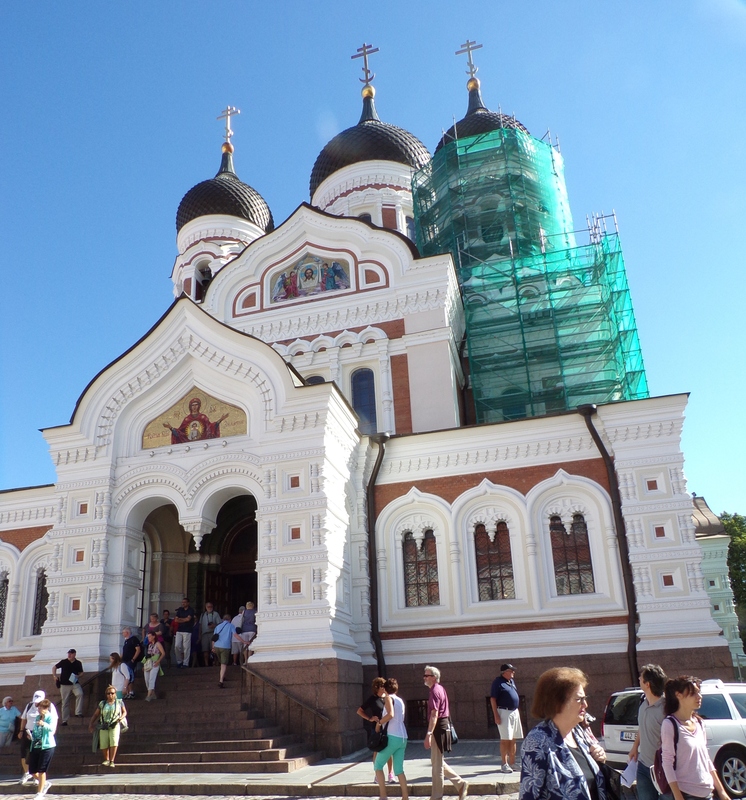 Eventually I found myself once again in front of the orthodox church where there were hordes of people coming and going and as I approached entrance to the church, I spotted a green Eurodam sticker – more than one! Yes! This group’s stickers had the number 10 on them. At least they’d be returning to the same ship. I asked a man if I could stay with their group, that I’d been separated from mine. Was there room on their bus? The woman in blue looking up is the guide of tour group #10. I explained to her my dilemma and she called the company she (and Uve presumably) work for. A stream of Estonian followed but it sounded encouraging. 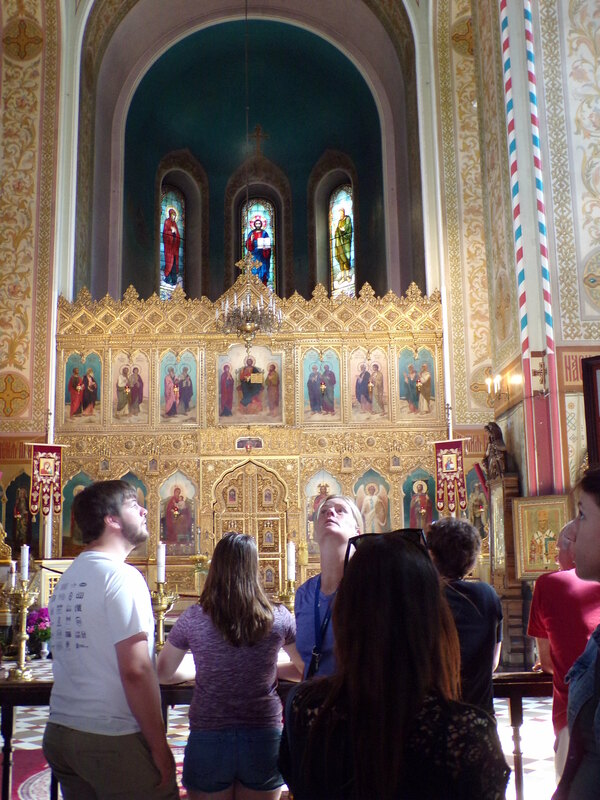 My group, she said, was at St. Nicholas Church, which was a bit complicated to get to from here. However, after that they were going to a restaurant in Town Hall Square. I fished out a piece of paper advertising the upcoming Russian bazaar on board from my bag, and also provided her with a pen. 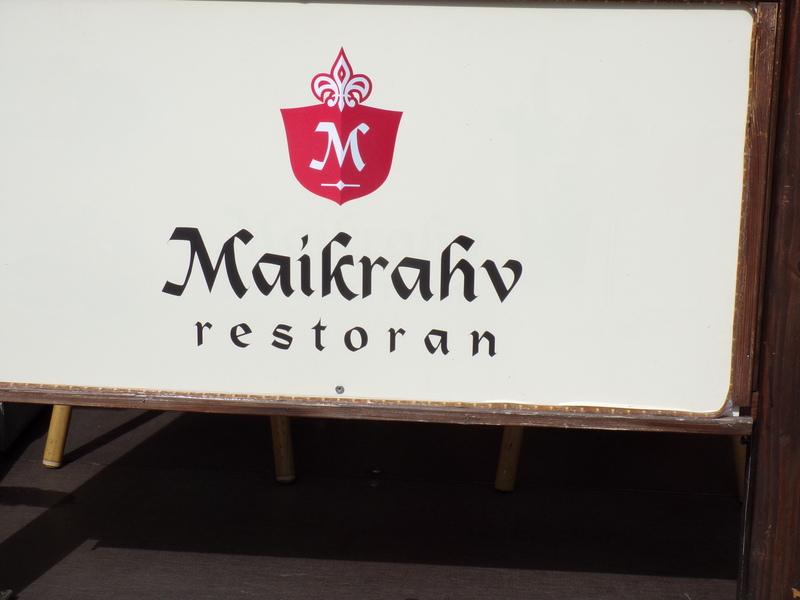 She wrote down the name of the restaurant – MAIKRAHV – and told me it was located inside the town hall. She was emphatic on that point. She also offered to let me stay with them (but they weren’t having lunch and were leaving earlier) or go to Town Hall Square to look for my group. She told her group that she just needed a minute to show me the way. The way was simple. She pointed out the street and told me to continue down it – “Go down, keep going down” until to the right I would see the square. It was a big square, she said. I couldn’t miss it. I decided to go, so I thanked her and off I went, tucking the piece of paper into my pocket. 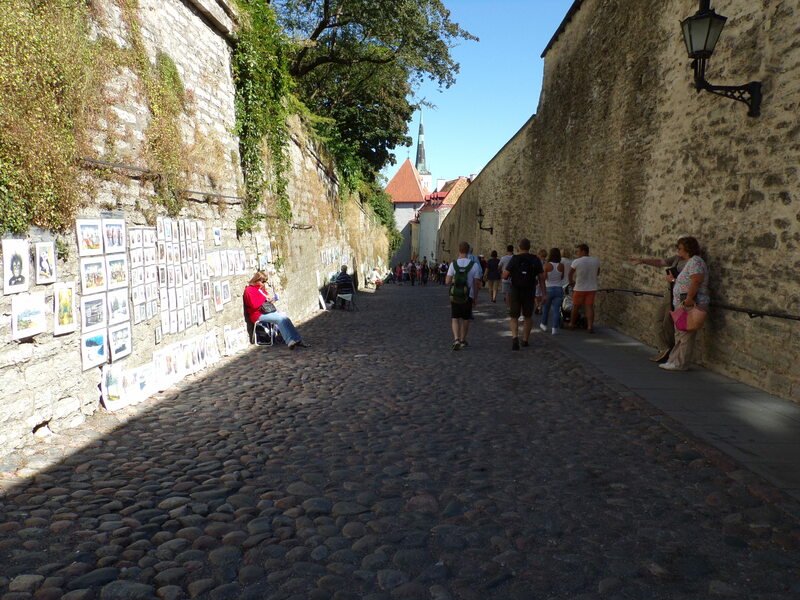 I descended the long cobblestone street, passing along another section of the old wall on my right; on the left, free-lance artists displayed their work for sale. After passing under a gate, I saw a large square to the right, full of outdoor restaurants with shade umbrellas over them, all of them bustling with people. 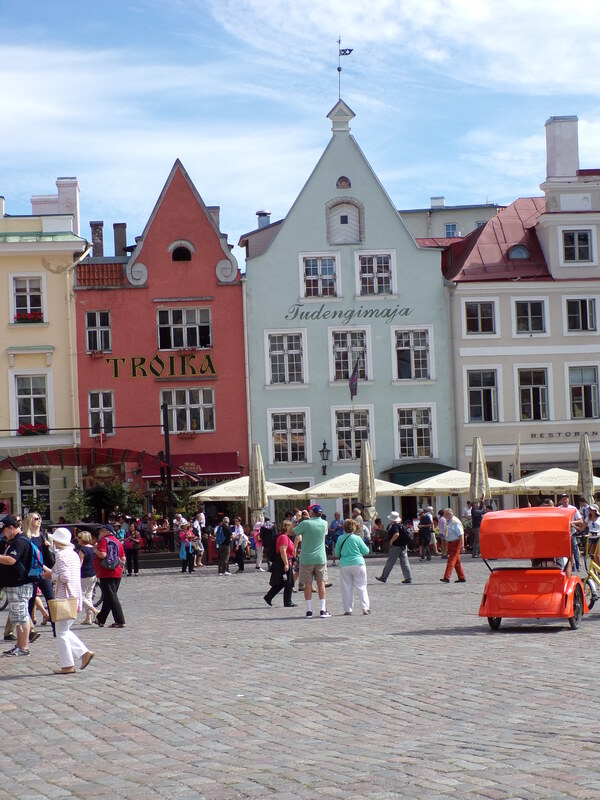 The square was lined with tall, colorful buildings with streets leading off it like spokes of a wheel. As soon as I stepped into the square, I spotted a young woman wearing an apron, obviously a waitress or something. I pulled out the piece of paper and smiled expectantly at her. “Do you speak English?” I asked. What? This made no sense. Where was the town hall? I thanked her and then went up to a young man standing in front of the next restaurant. “Can you tell me where is the town hall?” I asked him. 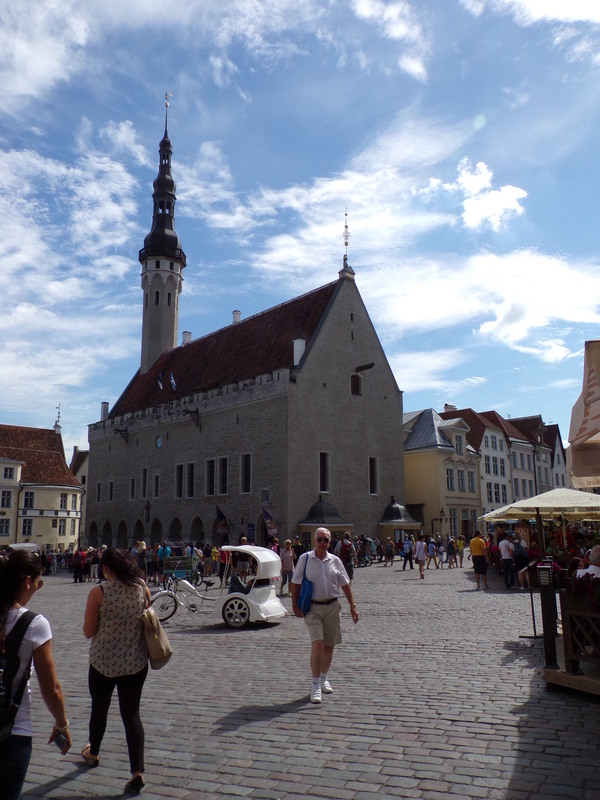 He pointed to an old medieval building across the square that had looked like it might have been a church at one time. I thanked him and headed over there. There was a door open, which led down a few stairs into a dark interior. A sign outside indicated there was some sort of art exhibit inside. I saw a man wearing a uniform standing in the shadows. I approached him and explained that I was looking for a restaurant inside the town hall, and showed him the name. 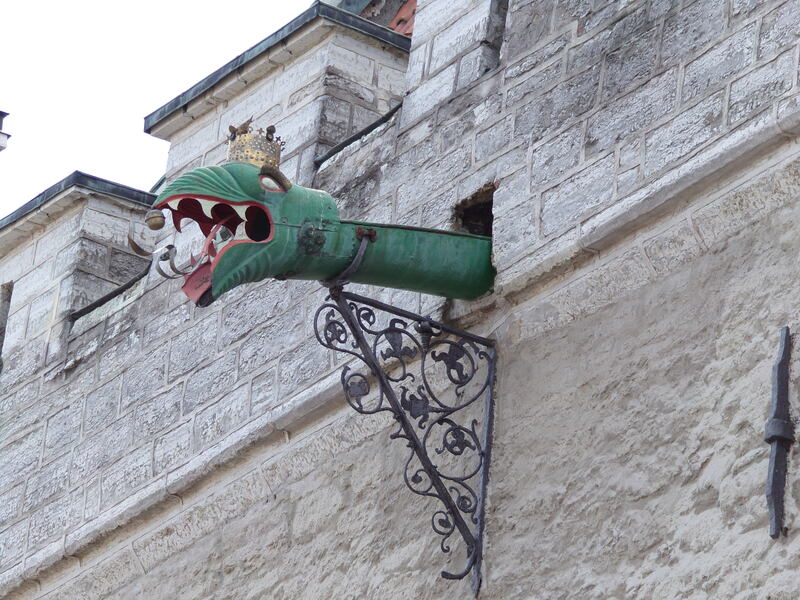 He said the town hall did have a restaurant, next door, but it was called Dragon. Strange. Why would the guides’ company give me a name of a place that no longer had that name? Even so, I went next door to check it out. As soon as I entered, I was pretty sure this wasn’t the right place. A woman wearing a long striped dress with an apron over it and a fitted cap was ladling out soup into cone- shaped ceramic bowls. She was also in charge of the register and dealing with customers. “Excuse me,” I said. She turned and looked at me. “I’m looking for this restaurant.” I showed her the slip of paper. She glanced and said, rather brusquely, “across the square” and nodded in that direction. I didn’t interpret her tone as rudeness – she was just very busy and hadn’t time for pleasantries. So I crossed the square once more and came to the same guy in yellow I’d talked to before; only this time, I showed him the name of the restaurant. He pointed to a doorway – sure enough, the name was printed overhead. I wouldn’t have noticed it before, what with all the tables outside and people sitting at them enjoying the outdoors. I was now beginning to understand what the first girl had been trying to show me. “It is our restaurant,” he said. He hadn’t seen the group wearing stickers like mine, but perhaps they were inside the restaurant. He led me partway to the entrance. Sure enough, down a short flight of stairs, I saw Uve standing there! What a relief! He did know that I (or someone) had been missing, but said they’d waited for five minutes for me, then had to go on their way. They had just arrived at the restaurant, and I saw everyone sitting around tables in the dimness. There was an empty seat next to a bearded man, and I asked if anyone was sitting there. The man said it was available, so I sat down. His name was David and his wife, sitting across from him, was Paula. They were from Halifax. The meal was excellent and came in three courses: salad with balsamic vinaigrette dressing; chicken breast over julienned vegetables, in a sauce that was very tasty if a bit peppery; and dessert cake: two layers of white cake, with a filling and topping of gelled blueberries and raspberries. 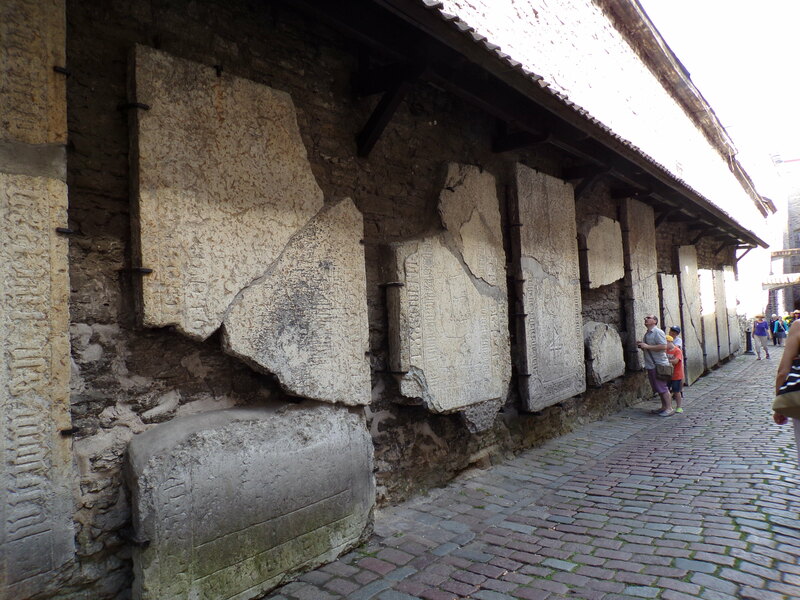 On our way to our last stop – shopping – Uve showed us the ruined wall of a church, where tombstones from the 14th and 15th century were displayed. Finally it was time for shopping! Paula and David were not going to let me out of their sight! Uve told us to meet in front of McDonald’s in half an hour. The three of us stuck together while shopping, and I probably bought at least one thing I wouldn’t have otherwise. 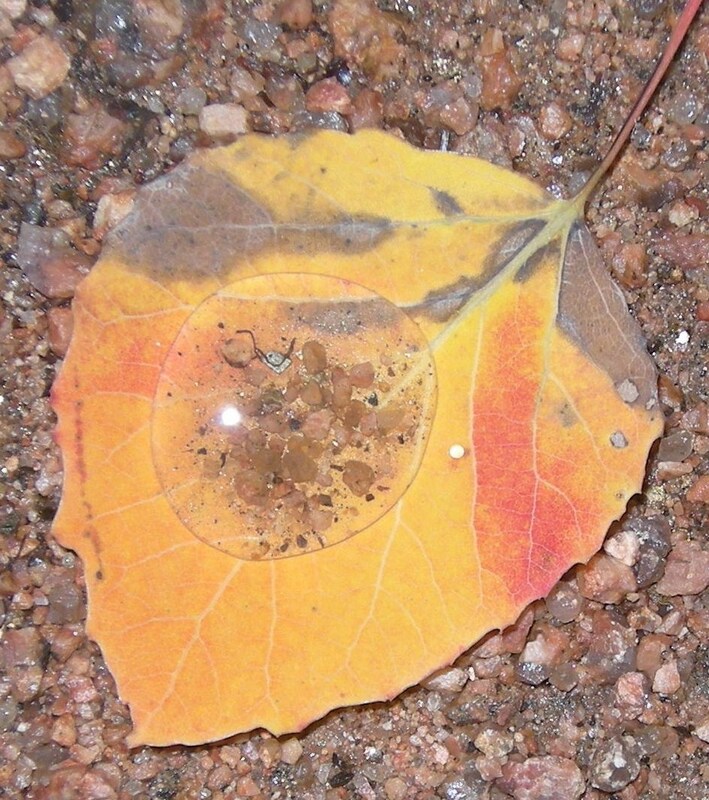 In retrospect, I wish I had purchased a piece of amber jewelry – expensive, but I may never have another opportunity! Here’s where we did a lot of shopping. 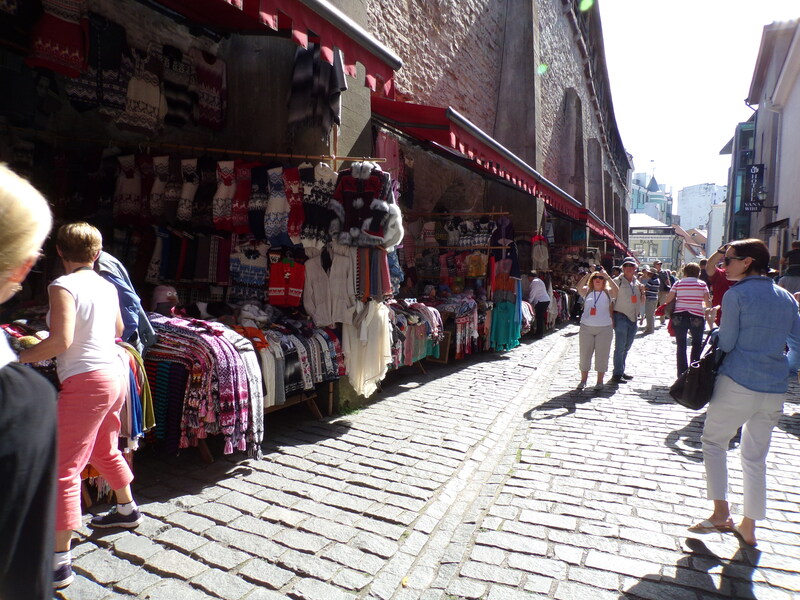 Open stalls on the left, against the old town wall, shops on the right.